But it won’t be easy for the ones who actually have to decide the issue, according to the head of a three-judge panel of the Kentucky Court of Appeals. 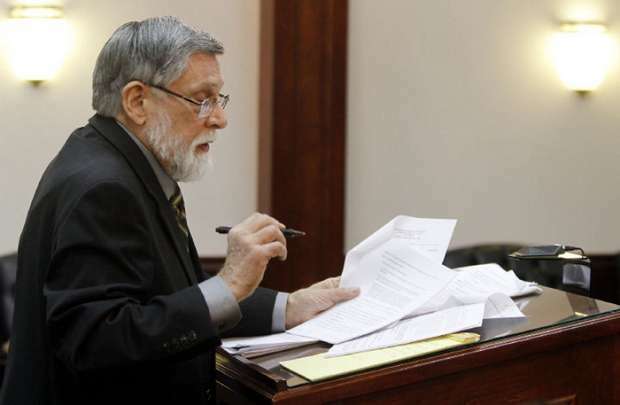 The panel heard oral arguments Thursday over whether Kentucky law can mandate that the state declare its reliance upon “Almighty God” for its safety and security. “The court is struggling with a difficult decision,” Senior Judge Ann O’Malley Shake said Thursday morning after lawyers quoted numerous court precedents that either allow or restrict the expressions of religion in the government sphere. “The distinctions have been drawn with difficulty over the years, and will be in this case, I’m sure, as well,” Shake said. At issue are laws passed in 2002 and 2006 — after the terrorist attacks of Sept. 11, 2001. And a 2006 act creating the state Office of Homeland Security requires its executive director to publicize this “dependence on Almighty God” in agency training and educational materials and through a permanent plaque at the entrance to its emergency operations center. Ten Kentucky residents — one of whom has since died — filed suit in 2008 to challenge the law after it received publicity for the first time. The appeals panel was hearing an appeal of Franklin Circuit Court Judge Thomas Wingate’s ruling in 2009 that declared the law to have “created an official government position on God,” in violation of the Kentucky and U.S constitutions. “We have all heard these words since grade school,” Thomas said. He added that it would be “irrational” to interpret the Kentucky constitution’s section on religious freedom as barring references to God when the current version of the constitution itself contains such a reference. Shake pointed out that the state’s emergency-management laws, which include the statutes in question, carry a misdemeanor charge for anyone who violates them. She questioned what would happen if an atheist became executive director of the Office of Homeland Security and balked at requirements to post the plaque and annual reports crediting Almighty God. But Thomas said the law doesn’t require anyone to profess trust in Almighty God — it only reflects the statement of the legislators who passed the Homeland Security laws. “It does not require the executive director to hold those beliefs,” he said. He said the Homeland Security director serves at the governor’s pleasure and that it would be up to the governor to deal with a director who refused to credit Almighty God. But Edwin Kagin, the national legal director for the group American Atheists, said the law’s intent was clear. Kagin cited the Supreme Court’s 2005 decision barring displays that include the Ten Commandments in McCreary County, Ky., as allowing courts to consider whether lawmakers’ had religious intentions in passing a law. He said that motivation was clear in a friend-of-the-court brief filed by 96 of the state’s 100 states representatives in support of the belief that the United States is a “Christian nation.” Thirty-five of the 38 state senators signed on to a similar brief. Judge Thomas Wine questioned why the law declared faith in one God rather than including various deities. Thomas cited the long history of government documents referring to a single God. Also serving on the panel was Judge Laurance VanMeter. Shake said the panel would decide the matter as quickly but as carefully as it could.